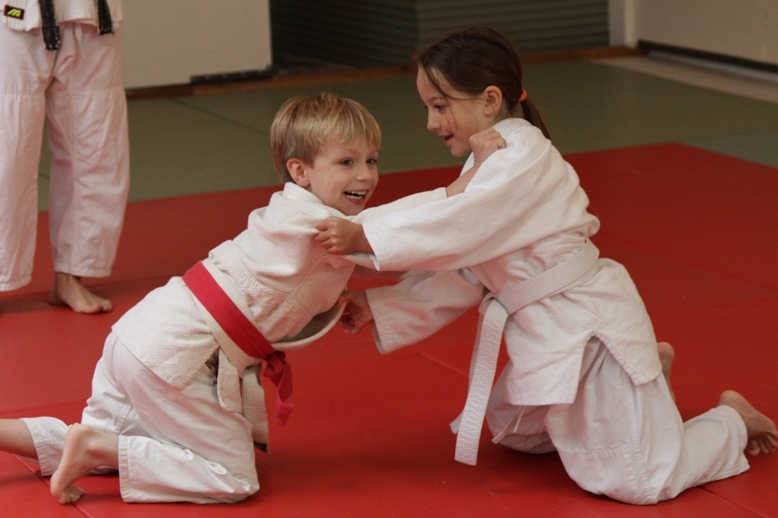 The beginning children’s class focuses on teaching the basics of Judo to youth. Students who attend the class first learn how to fall comfortably and safely. In addition, they learn basic pins and participate with their peers in newaza (groundwork). Once students have learned how to fall properly, they are taught non-weight bearing throws, such as footsweeps. 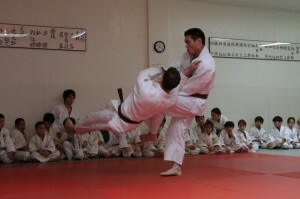 After developing adequate skills of falling and throwing without resistance, students are then allowed to learn and practice executing various techniques against their peers in randori (free practice). The students in the class have created a strong sense of community, which is exemplified by their dedication to the class and interaction with one another. The class is designed to be as safe, energetic, and fun as possible. In addition to teaching the techniques of Judo, emphasis is also placed on respect and good behavior. Many parents have found that this class has helped their children learn respect and discipline. At the end of each day’s practice, good behavior is rewarded with a game, promoting the #1 idea of the class: Have fun! The class is taught by Ken Kokka Sensei, Sayaka Torra Sensei, Themis Lonis and assisted by Leslie Lippard, Estefany Gonzalez, Nico Gonzalez, Sato Matsumoto, Masa Matsumoto, Taka Matsumoto, and Yoshiki Castillo. Many of the instructors have a long standing relationship with EBJI. Beginning Children’s Class meets Mondays and Wednesdays from 5:30 – 6:30 pm and Saturdays from 9 – 10 am. Once students have learned how to fall safely when in free practice with other kids, they move into the Intermediate class. In this class, basic techniques are fine-tuned and students spend a majority of their time in free-practice. Safety and control are always highly emphasized and monitored in this class due to the dynamic nature of randori. Students in the intermediate class begin by improving their footwork, movement, and gross motor skills, which is crucial in order to learn more complex combinations and execute weightbearing throws safely. Students also are encouraged to participate in competition, learn kata and be more involved in dojo activities. The intermediate class encourages and teaches hard work, discipline, emotional and physical control, leadership and responsibility in daily practice. In groundwork, students build on the pins and control they learn in the beginning class, and learn more advanced turnovers. In this class they also begin to learn basic chokes once they demonstrate the maturity to safely execute them with their peers. 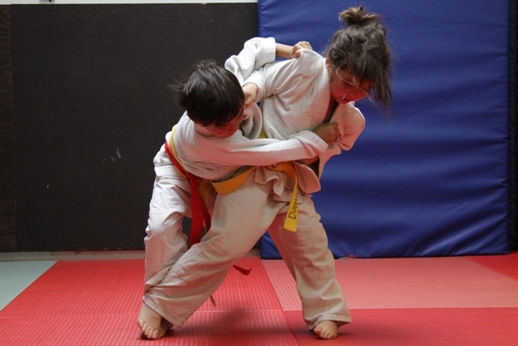 The class is taught by Stephanie Hata and Dan Israel Sensei, who have both been teaching judo for more than a decade. Intermediate Children’s Class meets Tuesdays and Thursdays from 6:30- 8:00 pm and Saturdays from 9-10 am. East Bay Judo Institute offers a recreational judo class, for adults and teens of all ages and levels. this class was started 9 years ago by Ken Kokka Sensei who, at the time, had several co-workers interested in learning judo and working out at a level accommodated to working adults. While the instructors and students have changed over the years, the instructional intent of Kokka Sensei for the Adult class has remained relatively unchanged. This class is geared toward the philosophical and technical aspects of judo while offering a light-moderate cardio and muscular exercise routine. Students typically workout and learn at their own pace in a mature class environment. Instructors will gear the workouts to the general needs and capabilities of the class. The class is taught by Dan Israel Sensei and Nate Torra, who both have a wealth of judo knowledge. The emphasis for the advanced class here at EBJI is to prepare the elite athletes for their next competition. The class is composed of an intensive training regimen that varies according to what stage the athlete is at in their training. The composition of this practice varies widely; it can consist of anything from solely endurance and plyometric drills or non-stop randori. Students that practice in this class focus on developing an expertise in executing a selective few techniques through rigorous practice and repetition. They are also encouraged to assimilate judo into their identity and life practice as long time practitioners and join the instructional staff at East Bay Judo. Practice and training schedules are overseen by Sayaka Torra Sensei, 2008 Olympic Team Member and head coach, as well as Ken Kokka Sensei and David Matsumoto Sensei, former Director of Development of USA Judo and the United States Judo Federation. Matsumoto Sensei, Ken Sensei and Sayaka Sensei all have a wealth of experience, skill and knowledge in traditional judo philosophy and technique as well as competition training and sports science. The Advanced Class meets Monday and Wednesday 6:30 – 8:30 pm, Friday from 5:30 – 7:30 pm and Saturdays from 10am – 12pm.